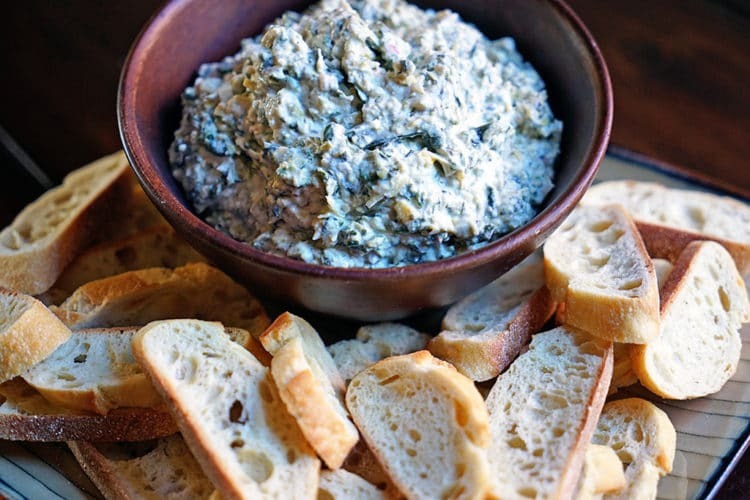 Super easy and a flavor bonanza, this Roasted Garlic, Spinach and Artichoke Dip is a party classic dip. Made with items probably on hand in the fridge too! Poking around in the refrigerator I saw a large jar of marinated artichokes. Who the heck bought these? I certainly don’t remember it, but I could have. You know it was a good deal at Costco, or something. Anyways, I could make a nice primavera pasta dish, or better yet, a dip. The dip idea won over as we were having company, and I busted out an old recipe I hadn’t made in years. There’s a reason I’ve kept this because it is a great one, a flavor bonanza! 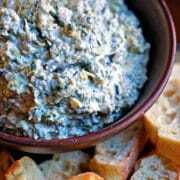 I had a large portion of roasted garlic from a recent recipe post and decided to make this Roasted Garlic, Spinach and Artichoke Dip. This is a rich, chunky and delicious dip that had me and the rest of our party going back for more – and more. I like to make most things from scratch, like sautéing the spinach here, but feel free to use frozen if you like. Roasting garlic isn’t rocket science either, and certainly not worth it’s own post, so here is the low down on making it happen. 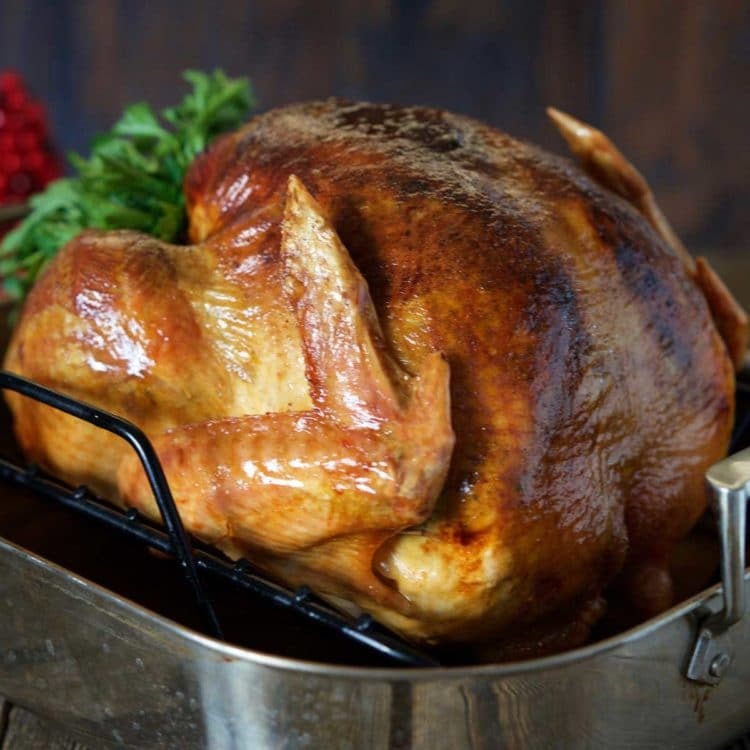 Preheat your oven to 350°. With a sharp knife slice the top portion of the head of each garlic bulb. 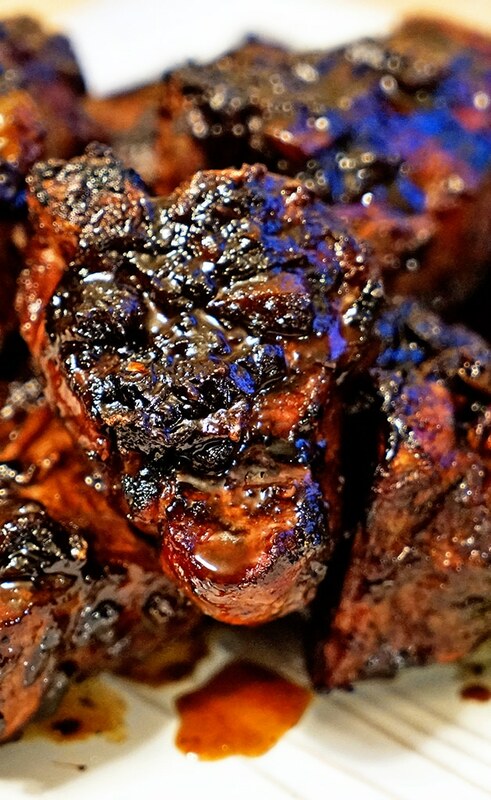 Place the top back on the garlic bulb and drizzle with olive oil. Wrap the sliced garlic bulbs in aluminum foil, making a nice little package and place in a 8” round cake pan or baking sheet. Roast for 45 minutes. Remove from oven and allow to cool. When cooled squeeze the garlic from each top and bottom into a container and top with olive oil to seal. This gets sticky, but get every last drop and discard the garlic skins. 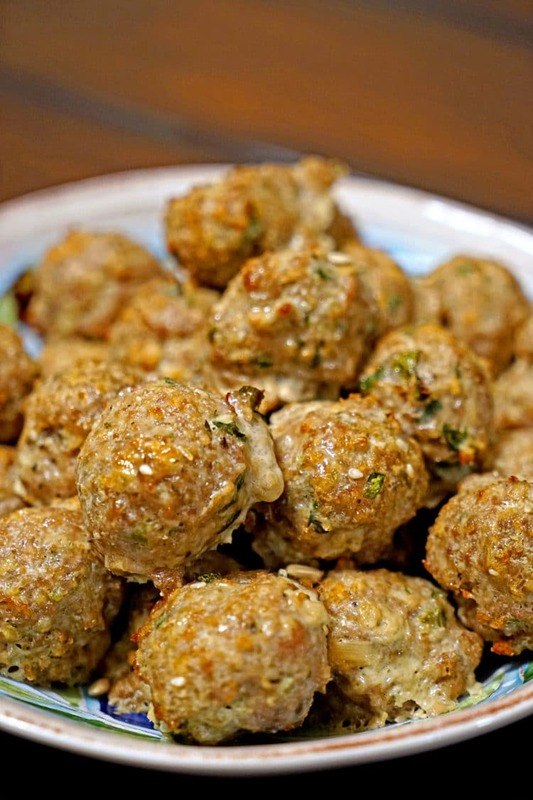 Store in the refrigerator for multiple uses or try them in my Roasted Garlic Turkey Meatballs. In a large skillet sauté fresh spinach with olive oil until wilted. Drain excess water and set aside. With a vegetable peeler, cut 3 lengthwise strips of zest from lemon. Save lemon for other use. In a food processor add the shallot, cream cheese, sour cream, milk, red wine vinegar, Parmesan cheese and lemon zest. Pulse several times to rough chop. Add the artichoke hearts and process until a smooth chunky mixture comes together. Add the cooked spinach and pulse several times to mix. Pour mixture into a greased 9”x9” baking dish and bake in a 350° oven for 20 minutes. Remove from oven and spoon into bowl. 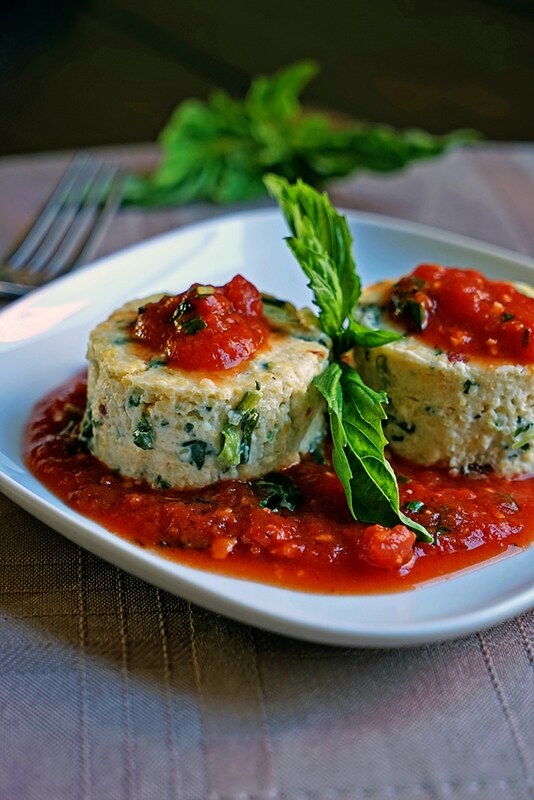 Serve with toasted bread or crackers of choice. This is some tasty dip right here. 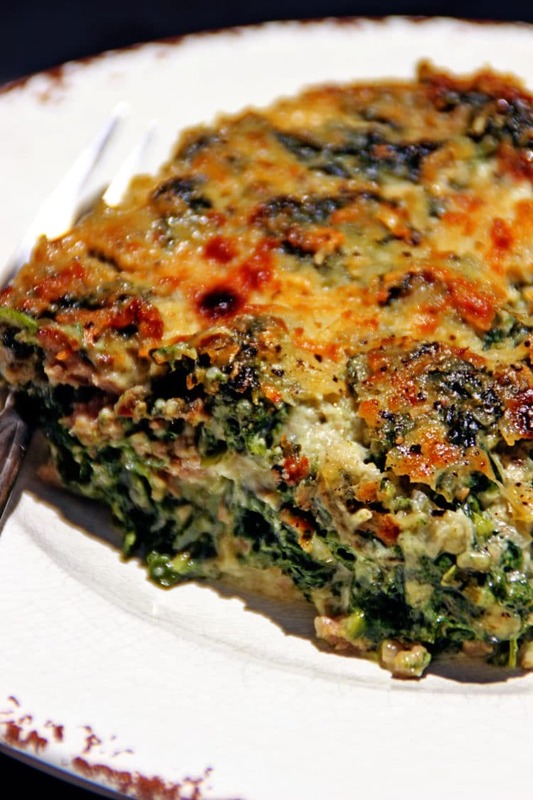 It’s chunky and each cheesy bite has bits of artichoke, spinach and that wonderful slow roasted garlic flavor. I especially enjoy the bits of lemon and shallot throughout. Like I said earlier, a flavor bonanza! 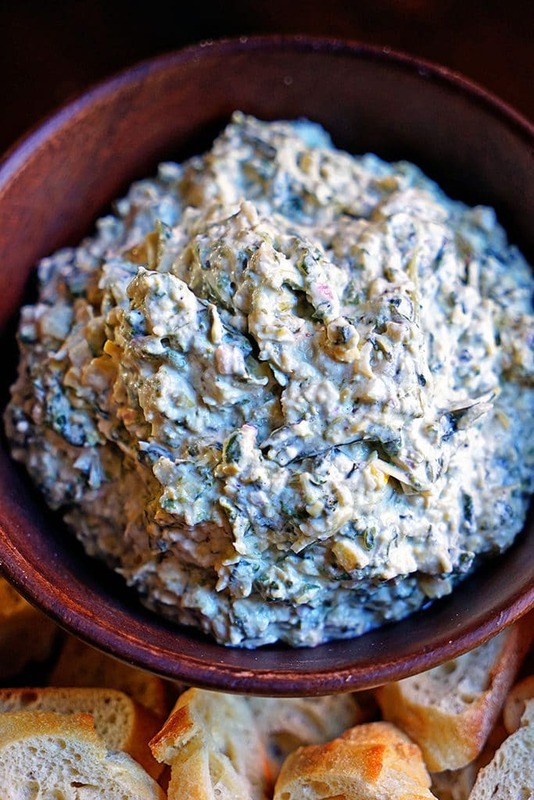 Easy to make, a filling and delicious dip for any party. Enjoy! Preheat oven to 350°. With a sharp knife slice the top portion of the head of each garlic bulb. Place the top back on the garlic bulb. Wrap the sliced garlic bulbs in aluminum foil, making a nice little package and place in a 8” round cake pan or baking sheet. Roast for 45 minutes. Remove from oven and allow to cool. When cooled squeeze the garlic from each top and bottom into a container and top with olive oil to seal. This gets sticky, but get every last drop and discard the garlic skins. Store in the refrigerator for multiple uses. With a vegetable peeler, cut 3 lengthwise strips of zest from lemon. Save lemon for other use. In a food processor add the shallot, cream cheese, sour cream, milk, red wine vinegar, Parmesan cheese and lemon zest. Pulse several times to rough chop. 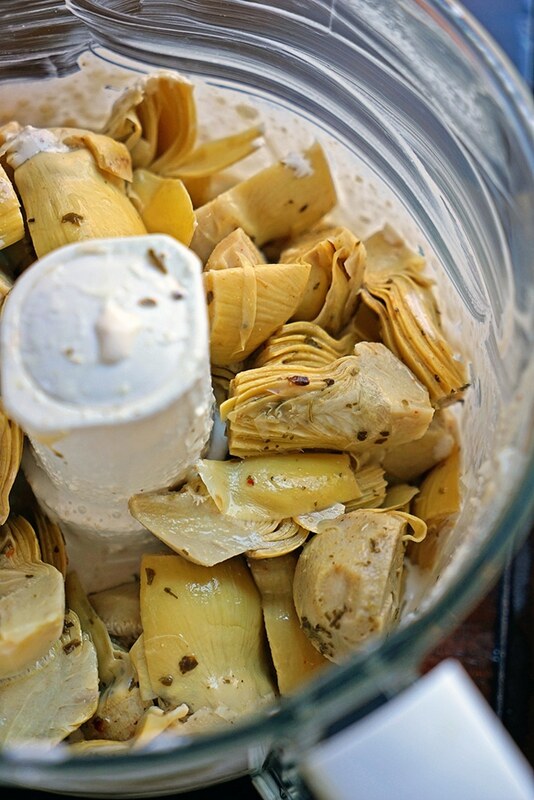 Add the artichoke hearts and process until a smooth chunky mixture comes together. 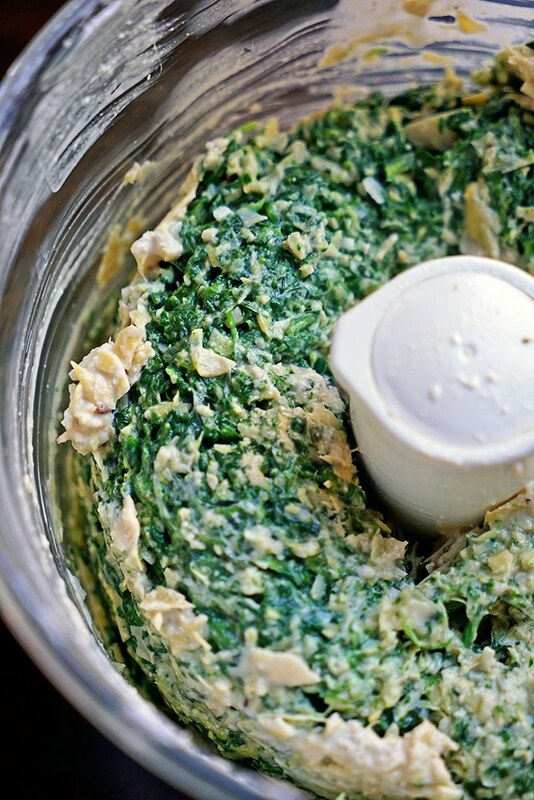 Add the cooked spinach and pulse several times to mix. Pour mixture into a greased 9”x9” baking dish and bake for 20 minutes. Remove from oven and spoon into bowl. 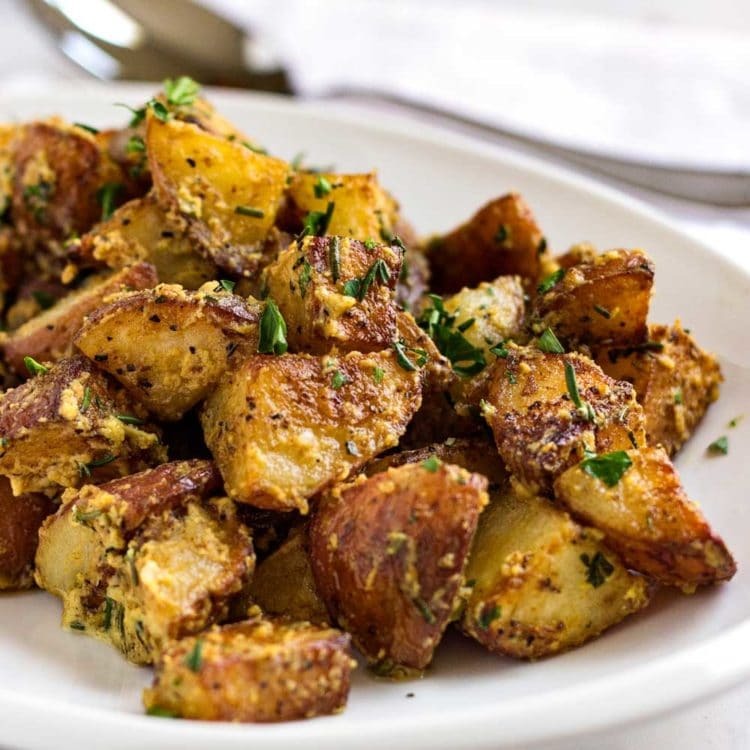 Serve with toasted bread or crackers of choice. 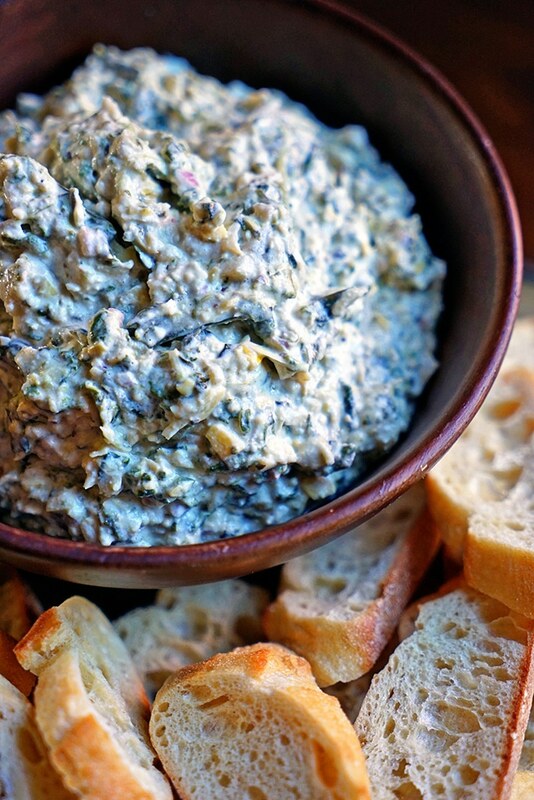 I love spinach artichoke dip and adding roasted garlic sounds so good!! Thanks Marissa. Trust you guys had a snow white holiday. Hope the New Year brings you both all the good stuff. Cheers! 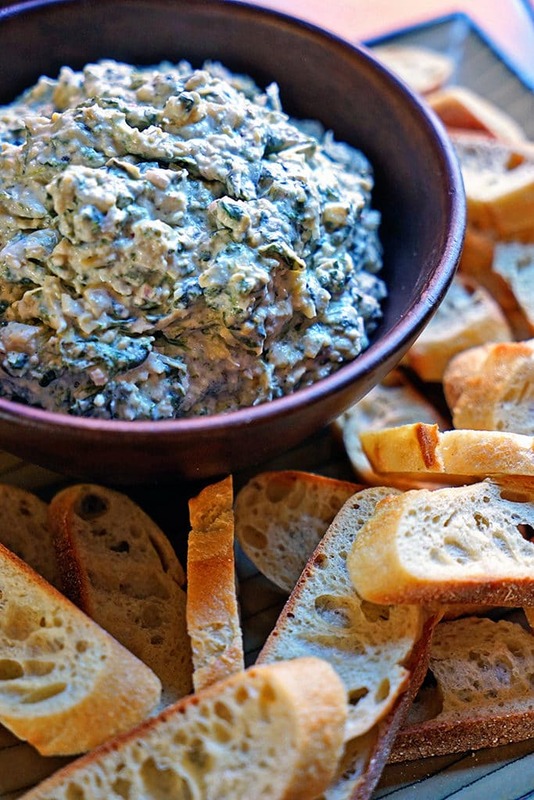 I love that you added roasted garlic to the classic spinach + artichoke dip. Great flavor twist! It just took it to another level! 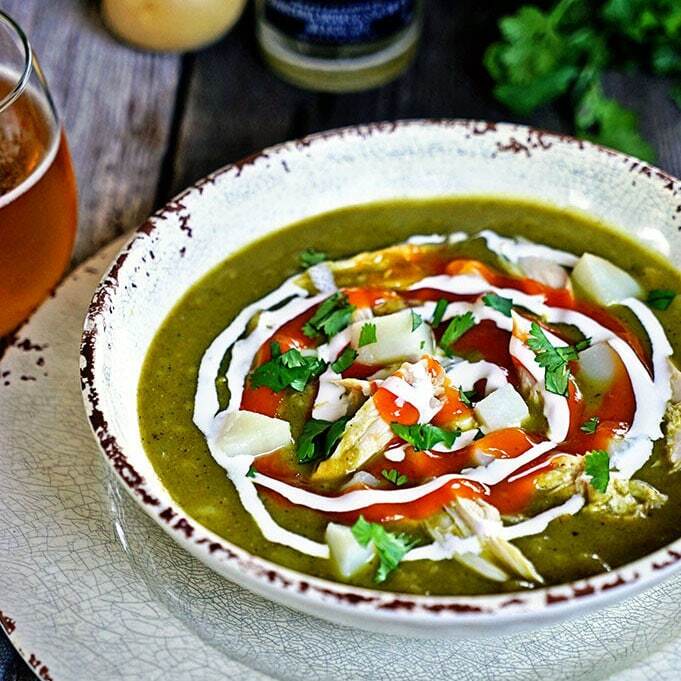 Kevin, I have been seeing spinach and artichoke dips everywhere on the internet around party season….and I never really “got” it. It’s not huge in Australia. 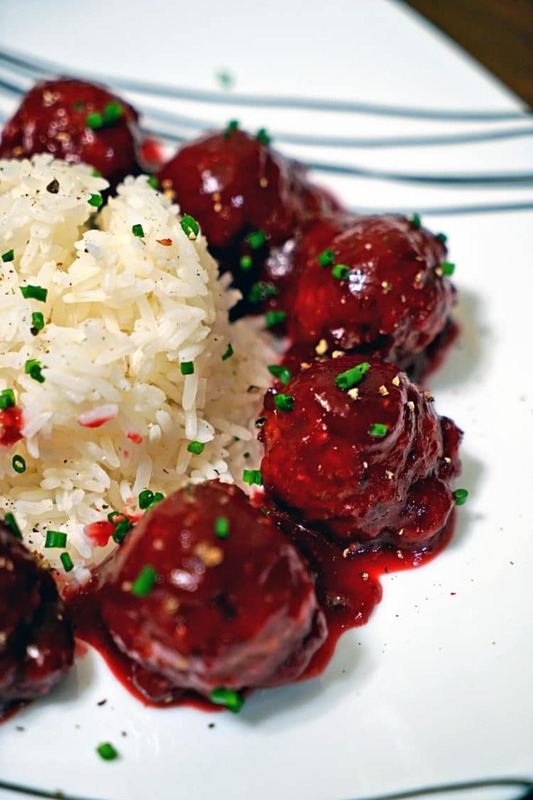 This is the first recipe I have actually read (because I trust your taste!). I “get” it now! I’m making it this weekend!! PINNING! I actually made this one back for a Super Bowl party we had a while back. 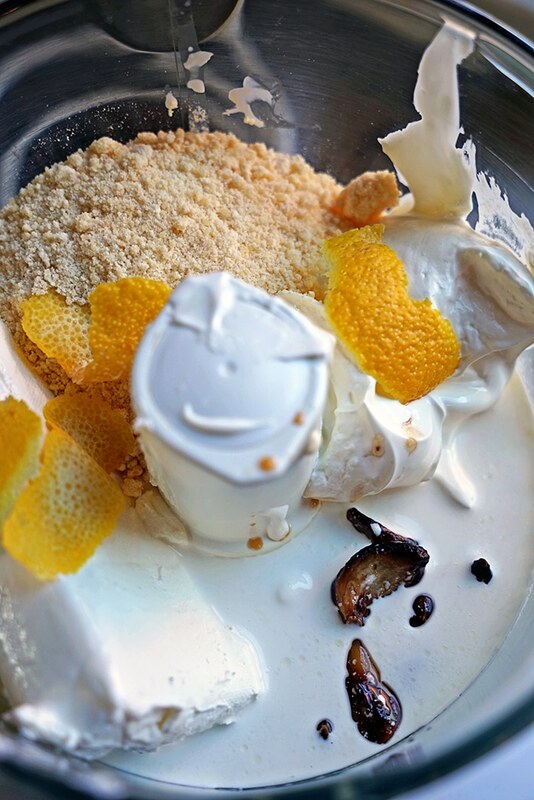 Two other food blogger friends posted their versions so I held back until one, David over at Spiced, prompted me to finally post my version. When all warm and gooey with toasted bread or spread on a cracker it’s really so good! 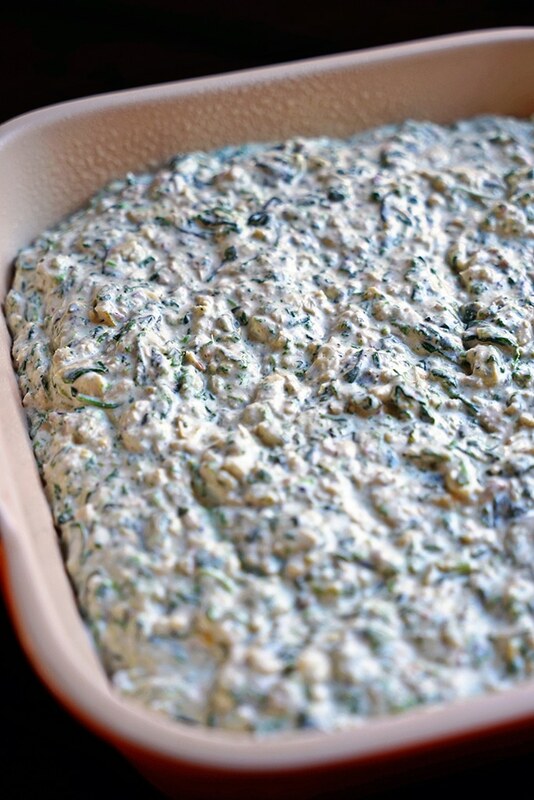 Totally digging the spinach artichoke dip, Kevin! You’ve been holding out on me for long enough…glad to finally see this! And the roasted garlic? What a fun twist on a classic! Did you save me any leftovers?